While historical reconstruction from archaeology inevitably includes an element of imaginative reconstruction and sometimes of wishful thinking as people see what they want to see, if gender roles were more equal this testifies to their being more than one narrative of how gender has been constructed, and even if in most societies men have claimed a socially superior status from women, they have not done so in all societies. Early Helladic EH 2800-2100 B.C.E. Middle Helladic MH 2100-1500 B.C.E. Late Helladic LH 1500-1100 B.C.E. Early Minoan EM 3650-2160 B.C.E. Middle Minoan MM 2160-1600 B.C.E. Late Minoan LM 1600-1170 B.C.E. Kastri = EH II-EH III (ca. 2500-2100) B.C.E. Convergence with MM from ca. 2000 B.C.E. Commerce was practiced to some extent in very early times, as is proved by the distribution of Melian obsidian throughout the Aegean area. We find Cretan vessels exported to Melos, Egypt and the Greek mainland. After 1600 B.C.E. there are indications of very close commerce with Egypt, and Aegean things made their way along the coasts of the Mediterranean. No traces of currency have been found, unless certain axeheads, too slight for practical use, were used for this purpose. The Aegean written documents found outside the area, have not yet proved to be epistolary (letter writing) correspondence with other countries. Representations of ships are not common, but several have been observed on Aegean gems, gem-sealings and vases. They are vessels of low free-board, with masts. Their familiarity with the sea has been proven by the free use of marine motifs in their decorating. Later in the twentieth century, discoveries of sunken trading vessels along the coasts have brought to the forefront an enormous amount of new information regarding the culture. For details of monumental evidence the articles on Crete, Mycenae, Tiryns, Troad, Cyprus, etc., must be consulted. The most representative site explored up to now is Knossos (see Crete) which has yielded not only the most various but the most continuous evidence from the Neolithic age to the twilight of classical civilization. Next in importance come Hissarlik, Mycenae, Phaestus, Hagia Triada, Tiryns, Phylakope, Palaikastro and Gournia. Structures: Ruins of palaces, palatial villas, houses, built dome- or cist-graves and fortifications (Aegean islands, Greek mainland and northwestern Anatolia), but not distinct temples; small shrines, however, and temene (religious enclosures, remains of one of which were probably found at Petsofa near Palaikastro by J. L. Myres in 1904) are represented on intaglios and frescoes. From the sources and from inlay-work we also have representations of palaces and houses. Structural Decoration: Architectural features, such as columns, friezes and various mouldings; mural decoration, such as fresco-paintings, coloured reliefs and mosaic inlay. Furniture: (a) Domestic furniture, such as vessels of all sorts and in varioius materials, from huge store jars down to tiny unguent pots; culinary and other implements; thrones, seats, tables, etc., these all in stone or plastered terra-cotta. (b) Sacred furniture, such as models or actual examples of ritual objects; of these we have also numerous pictorial representations. (c) Funerary furniture, e.g. coffins in painted terra-cotta. Art products: E.g. plastic objects, carved in stone or ivory, cast or beaten in metals (gold, silver, copper and bronze), or modelled in clay, faience, paste, etc. Very little trace has yet to be found of large free-standing sculpture, but many examples exist of sculptors' smaller work. Vases of all kinds, carved in marble or other stones, cast or beaten in metals or fashioned in clay, the latter in enormous number and variety, richly ornamented with colored schemes, and sometimes bearing molded decoration. Examples of painting on stone, opaque and transparent. Engraved objects in great number e.g. ring-bezels and gems; and an immense quantity of clay impressions, taken from these. Weapons, tools and implements: In stone, clay and bronze, and at the last iron, sometimes richly ornamented or inlaid. No actual body-armour, except such as was ceremonial and buried with the dead, like the gold breastplates in the circle-graves at Mycenae. Articles of personal use: E.g. brooches (fibulae), pins, razors, tweezers, etc., often found as dedications to a deity, e.g. in the Dictaean Cavern of Crete. No textiles have survived. Written documents: E.g. clay tablets and discs (so far in Crete only), but nothing of more perishable nature, such as skin, papyrus, etc. ; engraved gems and gem impressions; legends written with pigment on pottery (rare); characters incised on stone or pottery. These show two main systems of script (see Crete). Excavated tombs: Of either the pit or the grotto kind, in which the dead were laid, together with various objects of use and luxury, without cremation, and in either coffins or loculi or simple wrappings. Public works: Such as paved and stepped roadways, bridges, systems of drainage, etc. Monuments and records of other contemporary civilizations: E.g. representations of alien peoples in Egyptian frescoes; imitation of Aegean fabrics and style in non-Aegean lands; allusions to Mediterranean peoples in Egyptian, Semitic or Babylonian records. Literary traditions of subsequent civilizations: Especially the Hellenic; such as, e.g., those embodied in the Homeric poems, the legends concerning Crete, Mycenae, etc. ; statements as to the origin of gods, cults and so forth, transmitted to us by Hellenic antiquarians such as Strabo, Pausanias, Diodorus Siculus, etc. 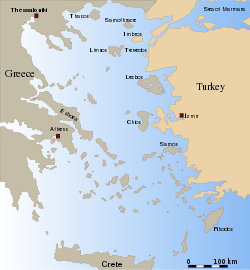 Traces of customs, creeds, rituals, etc: In the Aegean area discordant with the civilization in which they were practiced and indicating survival from earlier systems. There are also possible linguistic and even physical survivals to be considered. Mycenae and Tiryns are the two principal sites on which evidence of a prehistoric civilization was remarked long ago by the classical Greeks. The curtain-wall and towers of the Mycenaean citadel, its gate with heraldic lions, and the great "Treasury of Atreus" had borne silent witness for ages before Heinrich Schliemann's time; but they were supposed only to speak to the Homeric, or, at farthest, a rude Heroic loser beginning of purely Hellenic civilization. It was not until the 1900s when Schliemann exposed the contents of the graves which lay just inside the gate, that scholars recognized the advanced stage of art which prehistoric dwellers in the Mycenaean citadel had attained. There had been, however, a good deal of other evidence available before 1876, which, had it been collated and seriously studied, might have discounted the sensation that the discovery of the citadel graves eventually made. Although it was recognized that certain tributaries, represented e.g. in the XVIIIth Dynasty tomb of Rekhmara at Egyptian Thebes as bearing vases of peculiar forms, were of some Mediterranean race, neither their precise habitat nor the degree of their civilization could be determined while so few actual prehistoric remains were known in the Mediterranean lands. Nor did the Aegean objects which were lying obscurely in museums in 1870, or thereabouts, provide a sufficient test of the real basis underlying the Hellenic myths of the Argolid, the Troad and Crete, to cause these to he taken seriously. Aegean vases have been exhibited both at Sèvres and Neuchatel since about 1840, the provenience (i.e. source or origin) being in the one case Phylakope in Melos, in the other Cephalonia. 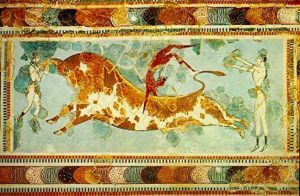 From reconstructing the historical and record, the Minoan Civilization appears to have been a flourishing culture that engaged in trade and commerce with a developed agricultural polity. Men and women appear to have enjoyed the same social status. It has even been surmised that the role of women may have contributed to the civilization's demise, attracting the animosity of others for whom women were relegated to more 'menial roles'. Greek civilization and myth would draw on that of the Minoans. Archeology on Crete has shed light on aspects of Homer's epic. A much debated question is what caused the demise of this ancient civilization. One possibility is that life became too comfortable, that too much was invested in luxury items, too little in what was needed to sustain society. The Minoans appear to have been a peaceful, trading people rather than warriors who aimed at conquest, so it is possible that they were defeated by the Mycenaeans. Other theories include annihilation by volcanic eruption. Ludwig Ross, the German archaeologist appointed Curator of the Antiquities of Athens at the time of the establishment of the Kingdom of Greece, by his explorations in the Greek islands from 1835 onwards, called attention to certain early intaglios, since known as Inselsteine; but it was not until 1878 that C. T. Newton demonstrated these to be no strayed Phoenician products. In 1866 primitive structures were discovered on the island of Therasia by quarrymen extracting pozzolana, a siliceous volcanic ash, for the Suez Canal works. When this discovery was followed up in 1870, on the neighboring Santorin (Thera), by representatives of the French School at Athens, much pottery of a class now known immediately to precede the typical late Aegean ware, and many stone and metal objects, were found. These were dated by the geologist Ferdinand A. Fouqué, somewhat arbitrarily, to 2000 B.C.E., by consideration of the superincumbent eruptive stratum. Meanwhile, in 1868, tombs at Ialysus in Rhodes had yielded to Alfred Biliotti many fine painted vases of styles which were called later the third and fourth "Mycenaean"; but these, bought by John Ruskin, and presented to the British Museum, excited less attention than they deserved, supposedly being of some local Asiatic fabric of uncertain date. Nor was a connection immediately detected between them and the objects found four years later in a tomb at Menidi in Attica and a rock-cut "bee-hive" grave near the Argive Heraeum. Even Schliemann's first excavations at Hissarlik in the Troad did not excite surprise. But the "Burnt City" of his second stratum, revealed in 1873, with its fortifications and vases, and a hoard of gold, silver and bronze objects, which the discoverer connected with it, began to arouse a curiosity which was destined presently to spread far outside the narrow circle of scholars. As soon as Schliemann came on the Mycenae graves three years later, light poured from all sides on the prehistoric period of Greece. It was recognized that the character of both the fabric and the decoration of the Mycenaean objects was not that of any well-known art. A wide range in space was proved by the identification of the Inselsteine and the Ialysus vases with the new style, and a wide range in time by collation of the earlier Theraean and Hissarlik discoveries. A relationship between objects of art described by Homer and the Mycenaean treasure was generally allowed, and a correct opinion prevailed that, while certainly posterior, the civilization of the Iliad was reminiscent of the Mycenaean. Schliemann got to work again at Hissarlik in 1878, and greatly increased our knowledge of the lower strata, but did not recognize the Aegean remains in his "Lydian" city of the sixth stratum. These were not to be fully revealed until Dr. Wilhelm Dorpfeld, who had become Schliemann's assistant in 1879, resumed the work at Hissarlik in 1892 after the first explorer's death. But by laying bare in 1884 the upper stratum of remains on the rock of Tiryns, Schliemann made a contribution to our knowledge of prehistoric domestic life which was amplified two years later by Christos Tsountas's discovery of the Mycenae palace. Schliemann's work at Tiryns was not resumed till 1905, when it was proved, as had long been suspected, that an earlier palace underlies the one he had exposed. From 1886 dates the finding of Mycenaean sepulchres outside the Argolid, from which, and from the continuation of Tsountas's exploration of the buildings and lesser graves at Mycenae, a large treasure, independent of Schliemann's princely gift, has been gathered into the National Museum at Athens. In that year dome-tombs, most already rifled but retaining some of their furniture, were excavated at Arkina and Eleusis in Attica, at Dimini near Volo in Thessaly, at Kampos on the west of Mount Taygetus, and at Maskarata in Cephalonia. The richest grave of all was explored at Vaphio in Laconia in 1889, and yielded, besides many gems and miscellaneous goldsmiths' work, two golden goblets chased with scenes of bull-hunting, and certain broken vases painted in a large bold style which remained an enigma until the excavation of Cnossus. In 1890 and 1893 Staes cleared out certain, less rich dome-tombs at Thoricus in Attica; and other graves, either rock-cut "bee-hives" or chambers, were found at Spata and Aphidna in Attica, in Aegina and Salamis, at the Heraeum (see Argos) and Nauplia in the Argolid, near Thebes and Delphi, and not far from the Thessalian Larissa. During the Acropolis excavations in Athens, which terminated in 1888, many potsherds of the Mycenaean style were found; but Olympia had yielded either none, or such as had not been recognized before being thrown away, and the temple site at Delphi produced nothing distinctively Aegean. The American explorations of the Argive Heraeum, concluded in 1895, also failed to prove that site to have been important in the prehistoric time, though, as was to be expected from its neighborhood to Mycenae itself, there were traces of occupation in the later Aegean periods. Prehistoric research had now begun to extend beyond the Greek mainland. Certain central Aegean islands, Antiparos, Ios, Amorgos, Syros and Siphnos, were all found to be singularly rich in evidence of the middle-Aegean period. The series of Syran built graves, containing crouching corpses, is the best and most representative that is known in the Legean. Melos, long marked as a source of early objects but not systematically excavated until taken in hand by the British School at Athens in 1896, yielded at Phylakope remains of all the Aegean periods, except the Neolithic. A map of Cyprus in the later Bronze Age (such as is given by J. L. Myres and M. O. Richter in Catalogue of the Cyprus Museum) shows more than twenty-five settlements in and about the Mesaorea district alone, of which one, that at Enkomi, near the site of Salamis, has yielded the richest Aegean treasure in precious metal found outside Mycenae. E. Chantre in 1894 picked up lusterless ware, like that of Hissariik, in central Phtygia and at Pteria (q.v. ), and the English archaeological expeditions, sent subsequently into north-western Anatolia, have never failed to bring back ceramic specimens of Aegean appearance from the valleys of the Rhyndncus, Sangarius and Halys. In Egypt in 1887 W. M. F. Petrie found painted sherds of Cretan style at Kahun in the Fayum, and farther up the Nile, at Tell el-Amarna, chanced on bits of no fewer than 800 Aegean vases in 1889. There have now been recognized in the collections at Cairo, Florence, London, Paris and Bologna several Egyptian imitations of the Aegean style which can be set off against the many debts which the centers of Aegean culture owed to Egypt. Two Aegean vases were found at Sidon in 1885, and many fragments of Aegean and especially Cypriote pottery have been turned up during recent excavations of sites in Philistia by the Palestine Fund. Sicily, ever since P. Orsi excavated the Sicel cemetery near Lentini in 1877, has proved a mine of early remains, among which appear in regular succession Aegean fabrics and motives of decoration from the period of the second stratum at Hissarlik. Sardinia has Aegean sites, e.g. at Abini near Teti; and Spain has yielded objects recognized as Aegean from tombs near Cadiz and from Saragossa. One land, however, has eclipsed all others in the Aegean by the wealth of its remains of all the prehistoric ages— Crete; and so much so that, for the present, we must regard it as the fountainhead of Aegean civilization, and probably for long its political and social center. The island first attracted the notice of archaeologists by the remarkable archaic Greek bronzes found in a cave on Mount Ida in 1885, as well as by epigraphic monuments such as the famous law of Gortyna. But the first undoubted Aegean remains reported from it were a few objects extracted from Cnossus by Minos Kalokhairinos of Candia in 1878. These were followed by certain discoveries made in the S. plain Messara by F. Halbherr. Unsuccessful attempts at Cnossus were made by both W. J. Stillman and H. Schliemann, and A. J. Evans, coming on the scene in 1893, traveled in succeeding years about the island picking up trifles of unconsidered evidence, which gradually convinced him that greater things would eventually be found. He obtained enough to enable him to forecast the discovery of written characters, till then not suspected in Aegean civilization. The revolution of 1897-98 opened the door to wider knowledge, and much exploration has ensued, for which see Crete. Thus the "Aegean Area" has now come to mean the Archipelago with Crete and Cyprus, the Hellenic peninsula with the Ionian islands, and Western Anatolia. Evidence is still wanting for the Macedonian and Thracian coasts. Offshoots are found in the western Mediterranean area, in Sicily, Italy, Sardinia and Spain, and in the eastern Mediterranean area in Syria and Egypt. About the Cyrenaica we are still insufficiently informed. This page was last modified on 3 February 2019, at 16:42.